What fun to accessorize your outfits from PJ’s to evening wear with something great to “top” off your look. Although our line of terrific hats, scarves, and head wear are suitable for anyone to wear, they especially meet the needs of women who have lost their hair. Brands such as Scala, and Dorfman, have a drawstring hidden inside the crown to enable the wearer to adjust the hat size to a perfect fit without affecting the look of the hat on the outside. We also carry an extensive line of unusual head wear such as sleep caps, hat liners, scarf caps, and 3-seam turbans. For those whose hair is thinning due to chemotherapy, we carry BeauBeau scarves/hats. 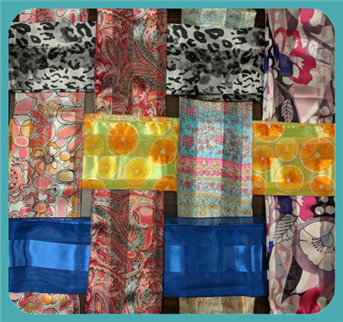 We offer lovely scarves in a wide selection of colors and patterns. These are available in a long, narrow style – great for tying on with a chic bun at the nape – or a 30 x 30 inch square; all in fine, soft 100% cotton voile that stays where you want it and remains tied all day. Our staff members will show you how to finish your look with a scarf to accent your outfit. 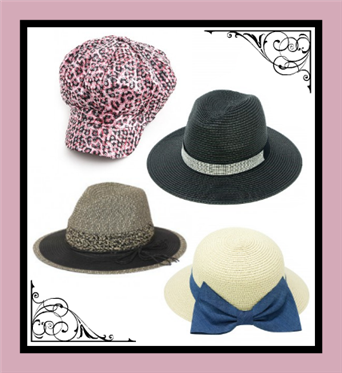 If you’re thinking your preference is for great headwear, talk to a friend or relative about throwing you a hat shower! What a great reason for a party! Any staff member will set up a registry for you and track your guest’s purchases; and they can shop in person or by phone. Your registry can be sent to guests by E-mail to add to the convenience. The goal of our Hair Loss Solution Center is to help those experiencing hair loss whether it is due to cancer treatment, alopecia or simply to change one’s look.Visit our Hair Loss Solution Center where we feature wigs made by Envy, Henry Margu, and Jon Renau. We offer our customers the most natural looking, highest quality, affordable wigs for hair loss that give a completely natural look and feel. All our wigs are synthetic with preset styles and are easy to care for. We also carry wig accessories: non-static shampoo, wig caps, brushes and wig stands. Our staff is devoted to the needs of women and is truly committed to easing you through this transitional time with a world of beautiful, comfortable wig options. Medicare and Medicare replacement plans do NOT cover wigs. However, most other private insurances will help with cost. Please call our Insurance Representatives for more information. 336.760.4333. 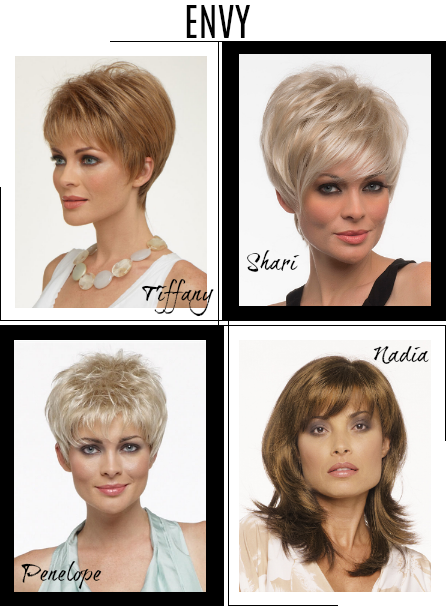 Scroll down to view our most popular wigs.